There is a confusion regarding the relation between adaptation and development not only among the general public but also sometimes among the adaptation practitioners. The objectives of the study was to understand what is climate change adaptation according to the practitioners? ; what are the main elements of adaptation projects? 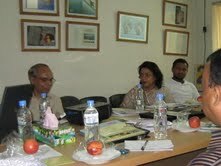 ; and what kind of adaptation activities are required to best address the climate change impacts in Bangladesh?. The study shows that the objectives of adaptation projects in Bangladesh can be roughly divided into four thematic areas: (1) Disaster Risk Reduction activities undertaken to reduce the vulnerability of climatic disaster affected community by different structural and non-structural disaster risk reduction activities; (2) Food Security activities addressing specifically the problem of food insecurity resulting from different climatic stress such as rise of temperature, flood, drought, salinity etc. ; (3) Livelihood activities mainly undertaken to achieve the diversification of livelihood options and livelihood improvement activities to reduce the impacts of climate change; and (4) Natural Resource Management activities integrating nature conservation and climate change adaptation objectives. In Bangladesh, climate change adaptation activities are mostly integration of two or more of the above mentioned themes as the themes are co-related and very much dependent on each other for sustainability. For example, engaging natural resource dependent climate vulnerable communities through disaster risk reduction or diversifying their livelihood options. This is an integration of natural resource management with disaster risk reduction or livelihood option. Although there are strong linkages between adaptation and development, the long term objective of adaptation is to reduce climate change vulnerability which may not be in case of development project. We know that development is prerequisite for any kind of adaptation activity. However, development activities most of the time tend to address the problem of poverty reduction which may in some cases increase climate change vulnerability. For example, the mass introduction of shrimp farming in the Chokoria Sunderban has resulted in mangrove loss. The unique patch of 8,500 hectares of mangrove was completely destroyed since shrimp farming has started. This exacerbates the impacts of extreme events in number and strength, posing severe risks for coastal communities in Bangladesh. Therefore, we have to be careful so that development activities do not increase the vulnerability of people. Also, rather than trying to distinguish the concepts of development and adaptation, we should find out the unique characteristics and profiles of adaptation and development and use them in planning future adaptation activities more effectively.